National Sports Day is observed every year across India on August 29 to mark the birth anniversary of the legendary hockey player Dhyan Chand who was born on August 29, 1905 and won gold medals in Olympics for India in the years 1928, 1932, and 1936. 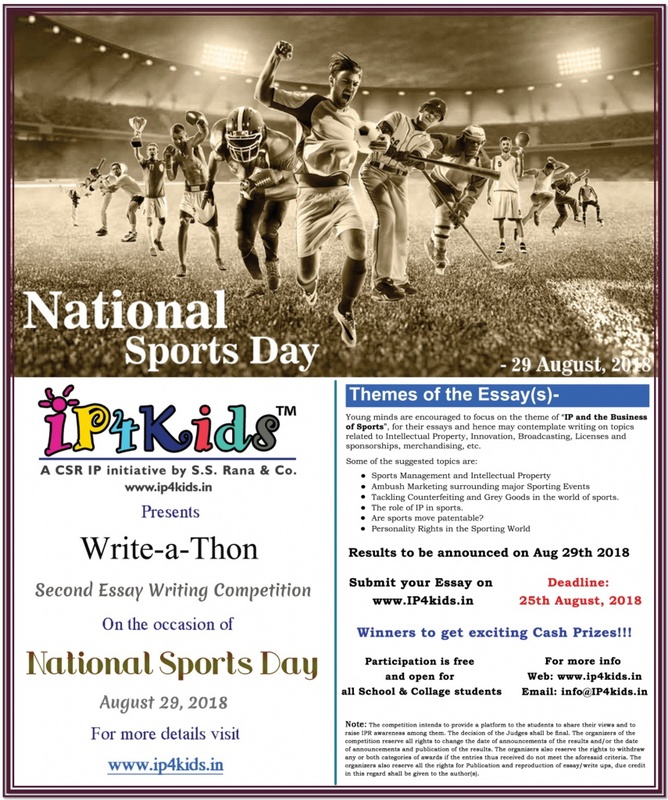 In light of the prospective sporting events that are scheduled to take place in the country, IP4kids a CSR initiative of S.S. Rana & Co. an Intellectual Property Law Firm, is organizing Write-a-Thon, an annual essay writing competition to give young students an opportunity to understand the role played by intellectual property rights in sports. Innovation and creativity are the key drivers in the world of sport. In every sporting field, inventors and creators are working behind the scenes to push the boundaries, creating new opportunities for enjoyment and for athletes’ to better their performance. Sports shows Intellectual Property in action. Patents encourage technological advances that result in better sporting equipment. Trademarks, brands and designs contribute to the distinct identity of events, teams and their gear. Copyright-related rights generate the revenues needed for broadcasters to invest in the costly undertaking of broadcasting sports events to fans all over the world. IP rights are the basics of licensing and merchandising agreements that earn revenues to support development of the sports industry. Young minds are encouraged to focus on the theme of “IP in the field of Sports”, for their essays and hence may contemplate writing on topics related to Intellectual Property, Innovation, Broadcasting, Licenses and sponsorship’s, merchandising, etc. Tackling Counterfeiting and Grey Goods in the world of sports. All entries are to be uploaded at the portal only. No physical form shall be accepted. Winner in the college and school category will be awarded prizes worth INR 5000 each. along with a certificate. For further information, please write to us at info@ip4kids.in or call us at 91-11-4012 3000. Note: The competition intends to provide a platform to the students to share their views and to raise IPR awareness among them. The decision of the Judges shall be final. The organizers of the competition reserve all rights to change the date of announcements of the results and/or the date of announcements and publication of the results. The organizers also reserve the rights to withdraw any or both categories of awards if the entries thus received do not meet the aforesaid criteria. The organizers also reserve all the rights for Publication and reproduction of essay/write ups, due credit in this regard shall be given to the author(s).